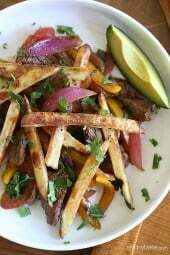 I put a healthier spin on Lomo Saltado (Peruvian Beef Stir Fry) one of my favorite Peruvian dishes! For all the meat and potato lovers out there, this healthier spin on a classic Peruvian stir-fry dish combines two of my favorite cuisines – Latin and Chinese! Add a little Peruvian Green Sauce on top if you like it hot!! Chinese cuisine in Peru, referred to as “Chifa”, is embedded in the Peruvian culture where you’ll find a wonderful fusion of flavors, colors, textures utilizing Chinese and Peruvian ingredients. 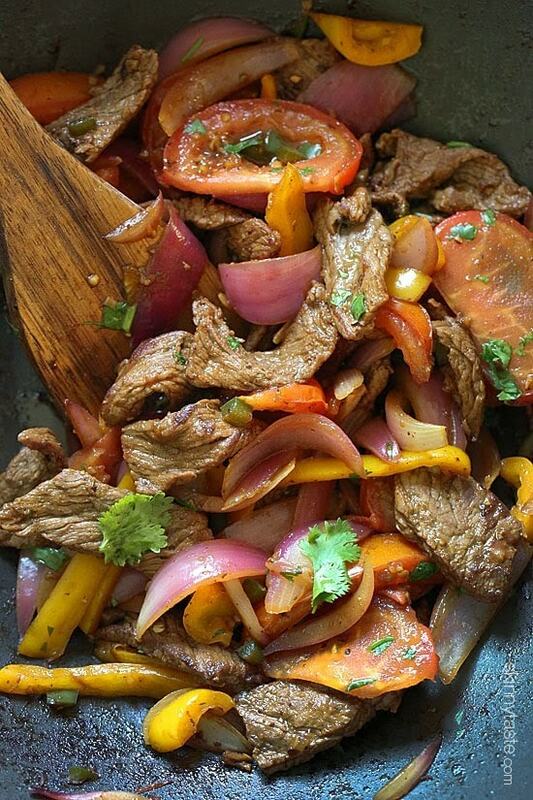 I took one of Peru’s most emblematic dishes, “Lomo Saltado” and lightened it up a bit – without losing any of it’s amazing flavor. This dish is made with strips of sirloin seasoned with cumin, stir fried with tomatoes, red onion, soy sauce, cilantro and finished with french fries – what a combination right? Well trust me, it works! In Peru they use a yellow pepper called aji amarillo, but it’s not commonly found here in the states, so I subbed it with a jalapeno and added mini yellow peppers in their place. 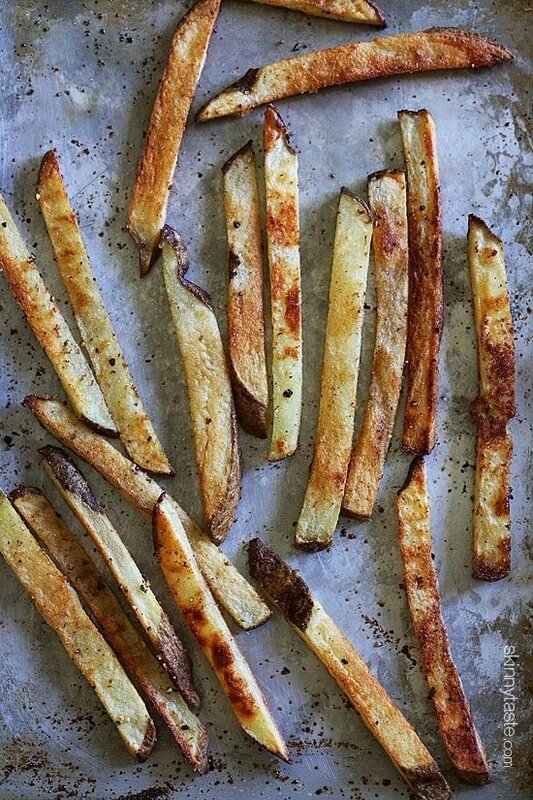 Rather than frying my potatoes, I baked my fries in the oven until golden and crisp, seasoned with salt, pepper and garlic powder – SO good! You’ll want to make these with everything! In Peru, they also serve this dish with rice, but I personally find it filling with just the potatoes plus I add a slice of avocado on the side, it’s perfect. Now, for those of you who have totally written off potatoes from your diet because you think they are bad for you, I’m here to tell you they are actually good for you! There’s lots of misconceptions about potatoes but the truth is they are not the carb devil everyone thinks they are! The fact is, potatoes are a whole food – that is food in it’s natural state, nothing processed or refined. In fact, one medium-size, skin-on potato is just 110 calories, has no fat, sodium or cholesterol, and it provides 45 percent of your daily value of vitamin C and has more potassium than a banana! 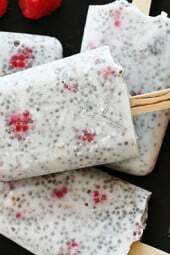 It’s also rich in fiber, potassium and magnesium, which are all listed as shortfall nutrients in the American diet. 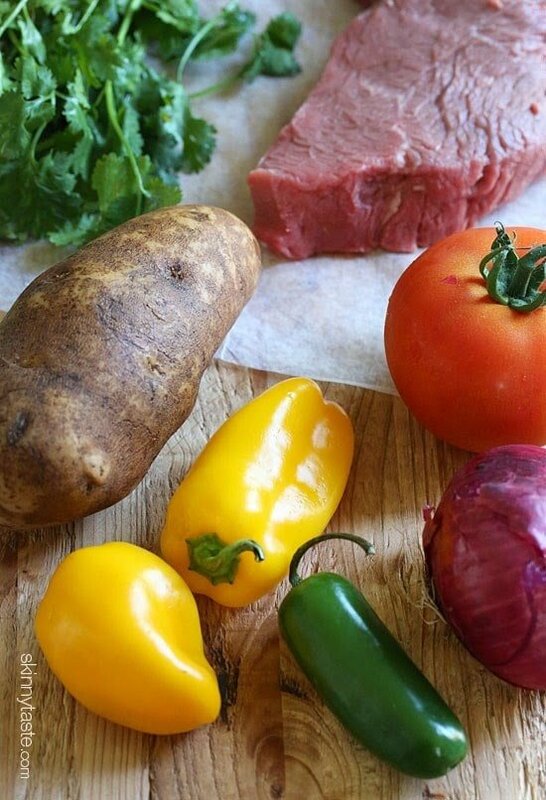 So don’t blame the potato – it’s often the preparation and toppings that add fat and calories. Plus, they are naturally gluten free and part of a clean eating diet! You can see more potato nutrition facts here. Lightly coat a baking sheet with cooking spray. 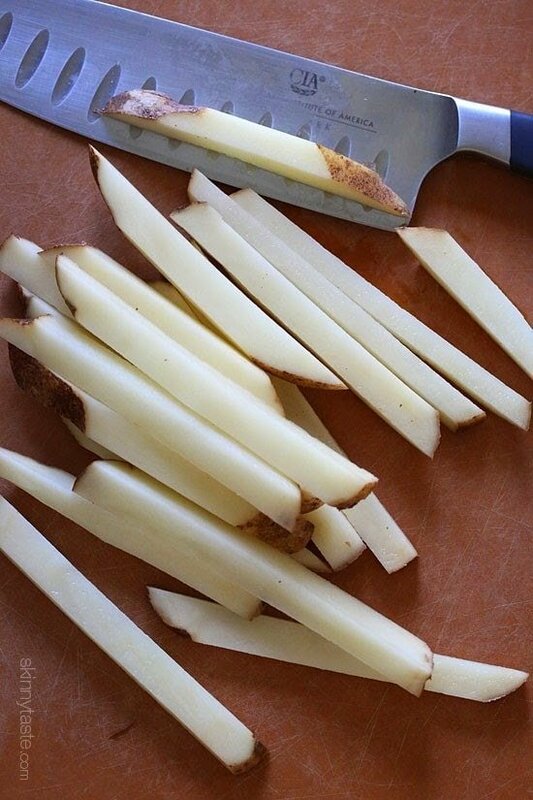 Cut the potato lengthwise into 1/3-inch thick slices; cut each slice into 1/3-inch fries. Place on the baking sheet and toss with oil to evenly coat. Season with garlic powder, salt and pepper. Place on a single layer onto the greased baking sheet. Bake uncovered on the lower third of the oven for about 25 minutes or until tender crisp and golden. Meanwhile, season meat with salt, pepper and cumin. Heat a large wok over high heat. When hot add the oil and the steak, cook about 2 minutes, until browned on both sides. 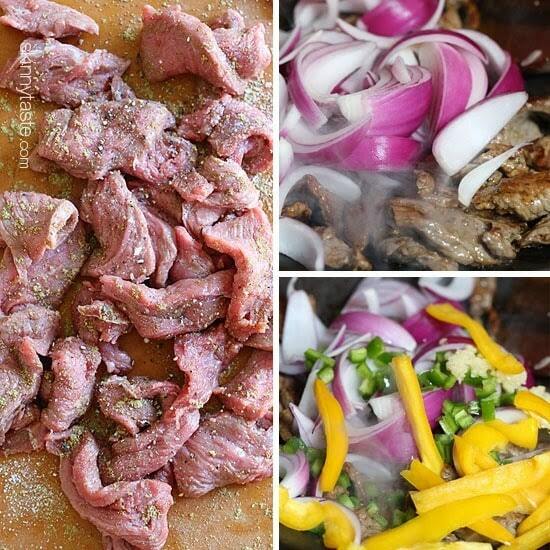 Add the onions, bell pepper, jalapeno and garlic and cook 2 minutes. 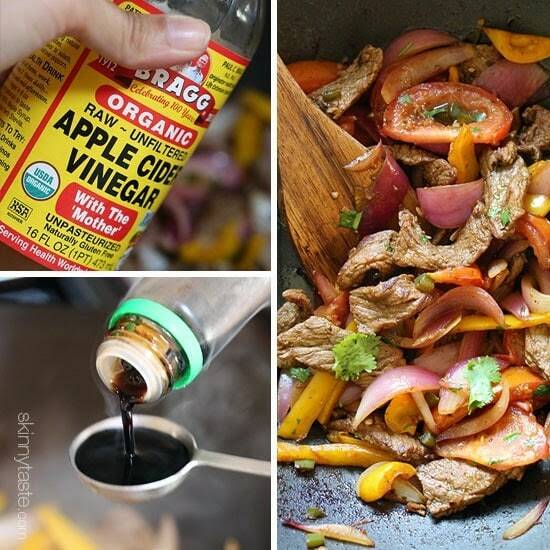 Add the tomato, soy sauce and vinegar and cook 1 more minute. Season with more salt as needed, remove from heat and finish with cilantro. 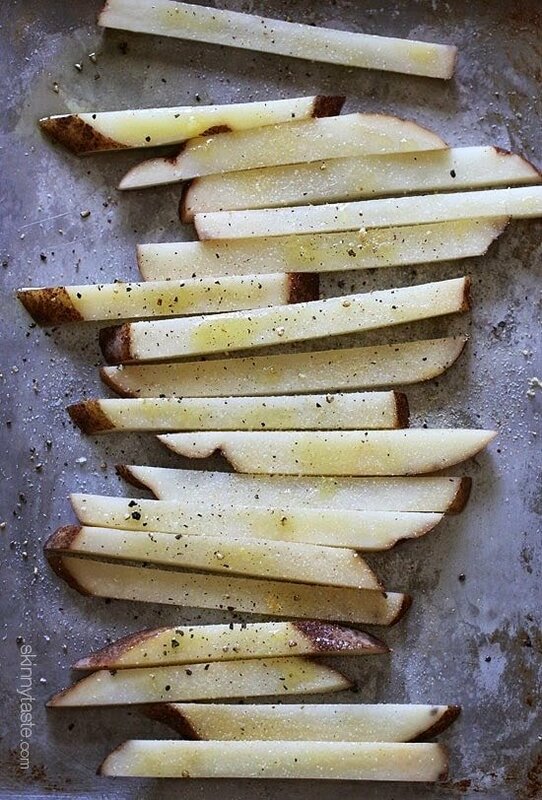 Serve immediately with french fries and divide evenly between 2 plates. I order this dish whenever I get Peruvian food (too often!) When I made your recipe, I truly could not tell the difference! 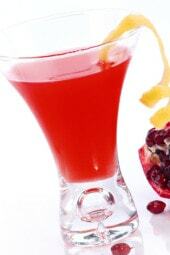 The flavors are spot-on–perfect! The green sauce also tastes the same (if not better!!) than the ones I’ve had in my local restaurants. Truly my favorite recipe of yours, I highly recommend it to anyone and everyone! I order this whenever I get Peruvian food (too often!) When I made your recipe, I truly could not tell the difference! The flavors are spot-on–perfect! The green sauce also tastes the same (if not better!!) than the ones I’ve had in my local restaurants. Truly my favorite recipe of yours, I highly recommend it to anyone and everyone! Made this for dinner Monday night and it was a huge hit! I left out the jalapeno and even my 21 month old daughter ate it right up! Will definitely be adding this dish to the rotation! 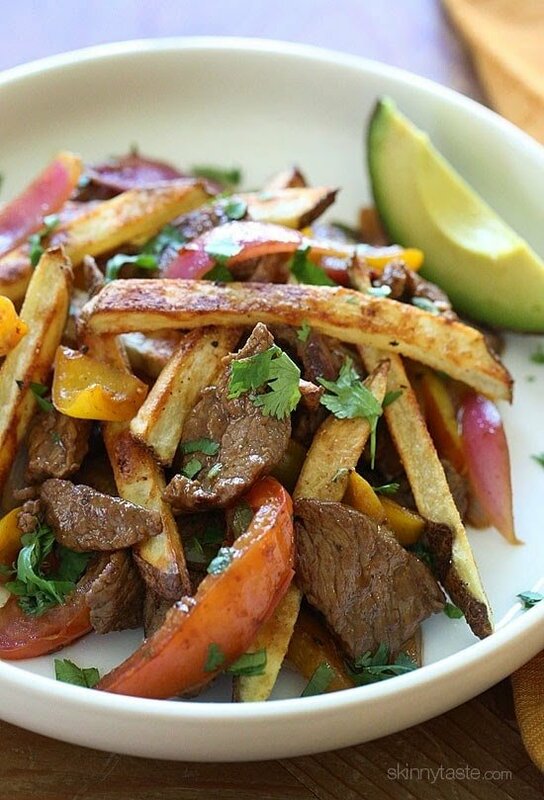 Amazing..loved this recipe and so did my husband a win win… the french fries were great on top of this!!.. thank you so much !!!! So I am not a stir fry person at all but my husband loves it so I decided to make this more for him. I ended up LOVING it. We both agreed that we would be making this for dinner weekly. Not only was it incredibly delicious, it was ready in no time at all. Thank you Gina!PS: Was wondering if there would be a variation with the sauce? I remember a post about Peruvian green sauce. Would that work with this recipe if we wanted to change it up? Made this last night & everyone liked it, great mix of flavors! 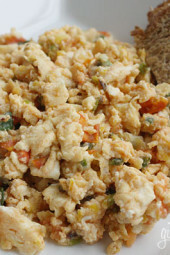 So delicious and very easy to make, we served it over brown rice with a few fries on the side.